You see it everywhere at this time of year: romantic cards, heart-shaped chocolate boxes, over-the-top helium balloons and extortionate restaurant prices – all because the Great British high street wants to take advantage of Valentine’s Day. But it’s not just the Hallmarks and Clintons of the world gearing up for the big day. Fashion brands, cinemas, supermarkets and amusement parks are all joining in with the festivities, hoping to benefit from the romantic side of us. And while some marketing campaigns tug on our heart strings, make us sigh and swoon and think of our loved ones, others seem the exact opposite effect; we cringe, gag and thank God that we’re still single so don’t have to be sucked into the ridiculousness of Valentine’s Day. Starting off on a good note is 20th Century Fox’s banner for the upcoming Marvel film Deadpool. Ryan Reynolds stars as one of the most unconventional anti-heroes imaginable as he takes revenge on the man who destroyed his life. Needless to say, it’s not exactly the heartfelt rom-com your girlfriend was hoping for. 20th Century Fox has a bit of fun with this V-Day themed ad, suggesting that it might be a romantic flick – inviting those-in-the-know to laugh at the in-joke. Tesco’s also been having a bit of fun with the upcoming festivities, as their employees set up some unusual displays. 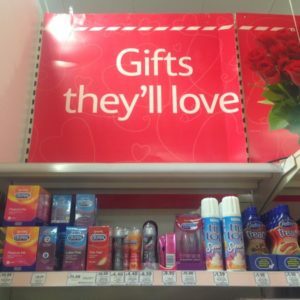 Also spotted around the stores were ‘Ideal for Valentine’s Day’ signs near the cucumbers and squirty cream… This may get a chuckle from some shoppers, but it’s been getting a few complaints – particularly as it’s a family friendly chain. “Mummy, why would you need a cucumber for Valentine’s day?” – need we say more? Do you have a Marmite lover in the house? If so, this marketing campaign might be aimed at you and your significant other. 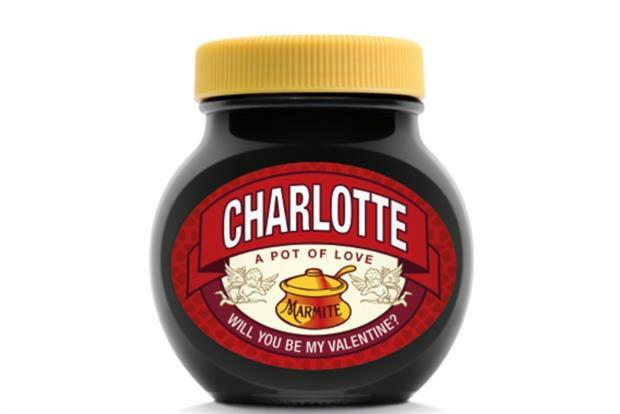 Marmite is running limited edition Valentine’s Day themed jars that customers can personalise for the big day. Put your partner’s name on the top and choose from the two slogans: ‘Love me or hate me, I’m yours’, or Will you be my Valentine?’ Where the ‘yeast extract’ description normally appears, the words ‘a pot of love’ have been added. Enjoy your romantic breakfast in bed with some decadent Marmite on toast… or not. Harry Potter fanatics can start hyperventilating now. Warner Bros. Studios Tour in London has been advertising a bewitching Valentine’s Day three-course meal for Muggles in the Great Hall. Promoted using striking imagery, the promise of drinks at Platform 9 ¾ and your own wand at the end of the night, it was bound to get mega Harry Potter fans all flustered. But you’d better have some spare cash lying around: the experience will set you back a whopping £500. In spite of the price tag, this Valentine’s Day marketing campaign has paid off – this spellbinding meal sold out very quickly.